National Basketball Association pre-season games are being played and in a sense, the pre-season is a reminder of what the National Basketball Association of the 1950s was like. Anyone willing to throw down a basketball floor could land a game. There are still some regular season games put on by promoters who are willing to lay down a floor in some arena, but those games happened in London, England and Mexico City not at a gym in Richmond, California or the Westchester County Center in White Plains, New York. For the most part, NBA teams are playing pre-season games in their home buildings with a handful of contests in non-league cities. The NBA for some reason has called pre-season games in Montreal and Vancouver the NBA Canada Series despite the fact the NBA has a team in Toronto. The NBA also had Birmingham, Las Vegas, San Diego, Anaheim, Chapel Hill, North Carolina, Tulsa, Oklahoma and China on the pre-season schedule. But there was one other city that would have a game. Seattle. 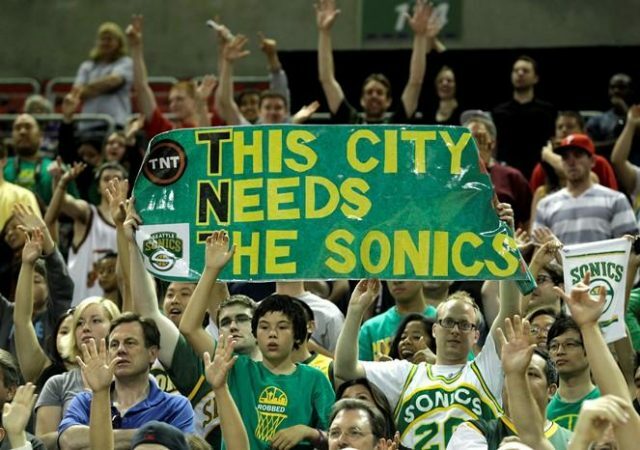 It has been 10 years since the NBA did business in Seattle. SuperSonics owner Clayton Bennett cut a deal with Seattle elected officials and was able to take his team that included Kevin Durant to Oklahoma City. Neither Bennett nor the previous owner Howard Schultz was able to get a new arena during their tenures as the Seattle owner. NBA Commissioner David Stern failed as a lobbyist to move Seattle and Washington state politicians and the market was abandoned. Chris Hansen tried to buy the Sacramento Kings franchise and move the business to Seattle in an arena he planned to build but that failed. Ironically, Durant and the Kings will be playing the final event in the old SuperSonics arena. The building will be renovated. Seattle will have a building along with TV and corporate support. The return of the SuperSonics has started.